The Master's Degree in Classical Archaeology aims at providing a thorough training in the field of Classical Archaeology. In particular, through a didactic methodology combining both traditional (archaeological, linguistic-philological, artistic) and innovative resources (applying the most advanced methods to the knowledge of the material culture), intends to train the second level graduates in archaeological and historical skills. The graduate in Classical Archaeology will be able to collaborate with public and private Institutions concerned with the protection and management of national and international archaeological and cultural heritage. The student will be qualified to take on the direction of international cooperation projects and programs for the promotion of the archaeological assets of non-European countries and the enhancement of the cultural resources and touristic purposes; join the Local Bodies for which a wide mandate is expected in the management and enhancement of Cultural Heritage. The Master’s degree program is in English and follows Unitelma Sapienza e-learning model. 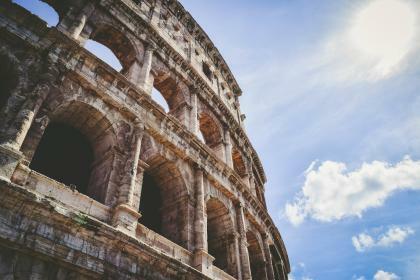 The student is required to complete fieldwork apprenticeship held in Rome or in another archaeological site agreed upon with the course board directors. The exams will be held exclusively at Unitelma Sapienza headquarters in Rome. All the subjects of the second year will be available in the 2018-2019 Academic Year. The exams will be held in Rome in conjunction with apprenticeships/traineeship in archaeological sites. The 6 CFU formative apprenticeship involves a presence for about 10-15 days at the assigned excavation site. The calendar will be scheduled considering the exams dates (for the apprenticeship in Rome). Enrollments are open throughout the year with no time limit. One can follow lessons, book exams, print certificates and connect with Unitelma Sapienza 24 hours a day, 365 days a year, from any computer, tablet, and smartphone. The enrollment fee is € 2,300.00 (plus the regional tax of 140 euros) that can be paid in three installments. For associate members of Unitelma Sapienza, the enrollment fee is € 1,800.00 (plus the regional tax of 140 euros) that can be paid in three installments.